I’m sure you guys have noticed, but I’ve been waiting for the official start of fall and finally, it has arrived, I am pumped! It’s my favorite time of year. So much to look forward to over the next three-ish months. So much to do, so much excitement and of course, so much awesome food! The food is my favorite thing about fall, it’s THE BEST. Clearly, I NEEDED to start off autumn with a roasted chicken. It’s just the quintessential fall thing to do. When I was a kid roasted chicken was my mom’s thing. It was one of the handful of dinners she would make, and she’d only make it on a Sunday night. She’d do all the prep for the chicken, roast it, check it, baste it, add more butter… Dad would make the rice, and possibly some kind of green, but I must admit, the greens were kind of scarce. SIDE NOTE: Dad used to ALWAYS eat salad every night for dinner, no matter what he was making us kids. He’d literally mow giant bowls of salad for dinner…the rest of just weren’t into that. Since I started cooking (and making food other than chicken and rice) dad has changed his ways, but he still loves a good salad. Mom would always attempt to make bread in her bread machine…but most of the time she’d start the bread at like five or six and with a four-hour cooking time, the bread was normally served after dinner, but before dessert. Either that or she’d throw loaf of bread in the oven from the store, BUT, there was an 85% chance she’d burn the bread. I am not trying to be harsh on her, but she is notorious for burning bread and or starting it way too late, and she’ll fully admit to it too. It’s just mom and we all love her for it. Anyway, I think my point in all this was, that to me, a roasted chicken symbolizes fall and family dinners. It’s such a loved meal for me solely for that reason. Well that and I swear, no one makes a roasted chicken better than my mom. Her secret? Salt, pepper, chicken broth, Vegata seasoning and umm, butter. Butter is a must, you knew that one was coming. She made it simple, but GOOD. I kind of fancified her chicken a bit though and stuffed a whole bunch of goat cheese and fresh herbs under that chicken skin. Oh my gosh, I know. WHAT! Yes, I somehow found a way to add cheese to a classic like roasted chicken. I think I have issues. WHATEVER. Everyone’s got issues. I can deal with it. Cheese rules, especially goat cheese. So it’s totally cool. I still kept the actual process of roasting the chicken simple and easy. I know the title sounds kind of fancy, but it’s really not, it’s a simple, easy meal to make for your family… or maybe even just for one. Then you can just eat the leftovers all week long. YUM! You’ve got the goat cheese stuffed under that skin. You also have some caramelized walnuts, sage and just a little rosemary in there too. From there you just rub the chicken with a little olive oil, salt + pepper. Oh, and butter…of course. 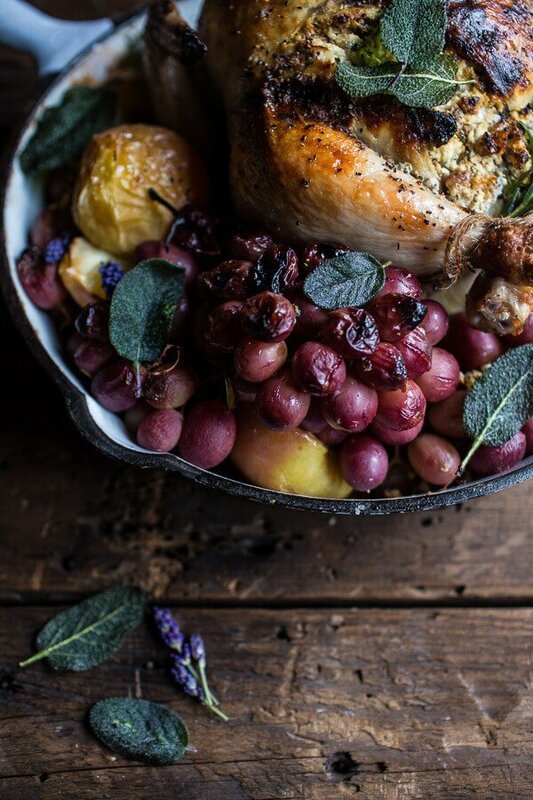 Then throw some grapes in a roasting pan and place the chicken on top of the grapes and roast away! Don’t be weirded out by the roasted grapes. They’re kind of my new favorite thing!! I love, love, love using grapes in a savory way like this and the flavors pair so perfectly with the flavors from the chicken + goat cheese. It’s kind of magical. <–Truth. OH! And one of the most important parts is the apple cider. You know how some people baste their chicken with chicken broth? Or maybe you don’t baste your chicken, I don’t know, but today we are basting our chicken in a reduced apple cider sauce. It’s sweet and makes for the most perfect, golden caramelized skin. If you’re a lover of the skin (which oddly not a single soul in my family is), than you will LOVE this little step. 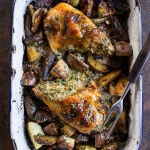 Plus, it really helps to keep the chicken moist and tie in all those awesome fall flavors! You've got the goat cheese stuffed under that skin. You also have some caramelized walnuts, sage and just a little rosemary in there too. From there you just rub the chicken with a little olive oil, salt + pepper. Oh, and butter...of course. *To intensive the cider flavor you can also brine the chicken in cider overnight. Add the chicken to a LARGE pot or even a plastic box of some sort. Pour over 16 ounces of apple cider and then add enough water to cover the chicken completely. Add 1/2 cup kosher salt and 2 tablespoons chopped fresh sage + rosemary. Cover and place in the fridge overnight. The next day, remove the chicken from the brine and pat completely dry, follow the directions above. 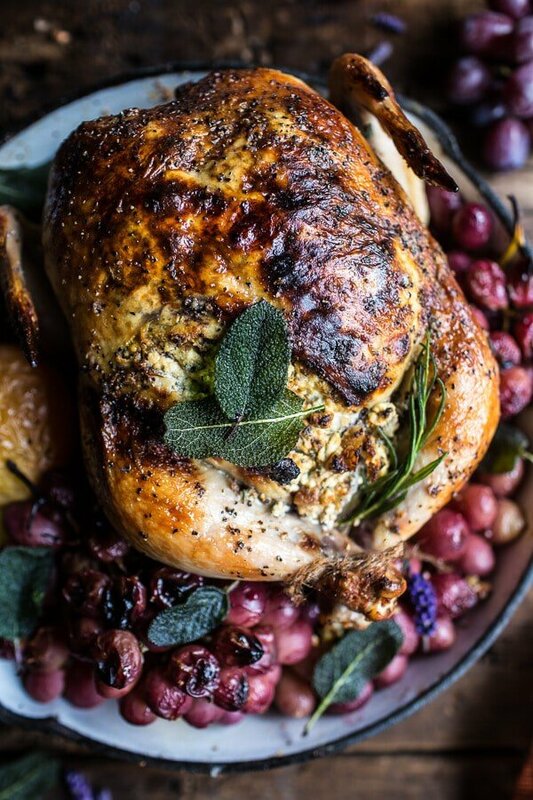 Come on, doesn’t this fall harvest cider roasted chicken just make you feel all warm and cozy?!?! YES! 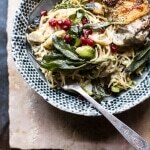 I’ve sent a complaint to Pinterest, as I so want to be able to keep pinning your gorgeous recipes!! This happened to me once, and it was solved pretty quickly. Thank you so much for your efforts, I am SO grateful! Hope you had a great day! I agree roasted chicken dinners remind me of Sunday family meals. I also roast one as soon as the weather begins to chill. Plus your house smells so good when then are cooking. I’ve never roasted grapes have to give that a try. I am setting up to make 3 chickens this weekend as we are having a dinner party. I chose the theme Celebrating the Fall Harvest”. This recipe looks perfect. Can we use the garlic as roasted baked garlic and serve it with french bread? that is what I am hoping to do. How does the apple come out after? Is it like baked apples? Can I serve them with a bit of the goat cheese warm? Just trying to be creative. This recipe looks fab and has lots of potential. Thank you so much for this post. Will let all know. I really want to impress my step family with this recipe hehe, but can we substitute the goat cheese by another one ? Like do you have idea can other one i can pick ? And did you try your recipe with other nuts like pecans ou hazelnuts? Oh! Do you suggest to cook basmati rice or potatoes or maybe other things with ? -A novice cook who needs some help ;P .
Hi! I recommend using a cheese you like. What about feta or mascarpone? Other nuts will be great. hope this is a hit! Great recipe and I did contact Pinterest for you!! 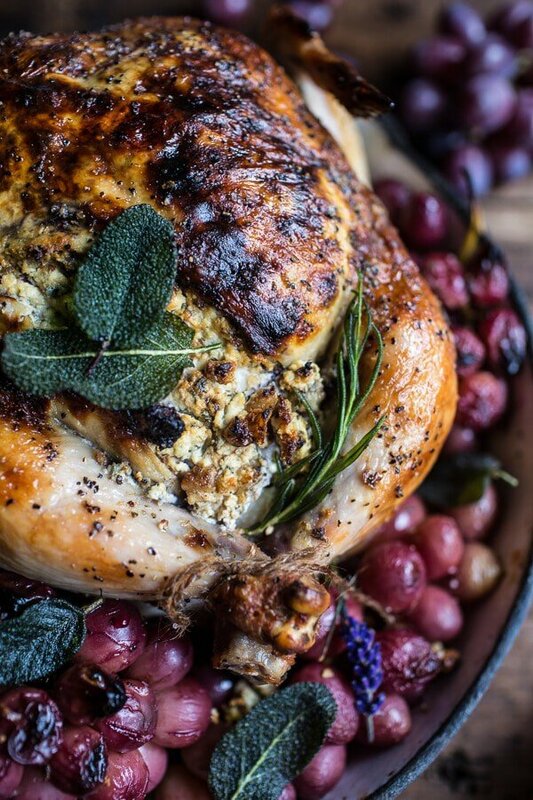 This chicken looks awesome and I love hearing about your nostalgic family memories. Your mom sounds just like mine when it comes to burning things, so hilarious. By the way, I contacted pinterest so I hope it might help. You have to get your account working again! You are like the best pinner they have, how could they flag you? Good luck getting it fixed Tieghan and happy first day of Autumn! HO WOW!! SO KIND!! Thank you so much for your efforts, I am SO grateful! Hope you had a great day! In my best Ron Weasley voice…”bloody hell”… I think I pin almost every recipe you post. Have contacted Pinterest! Maybe they flagged you because you have so many people pinning your amazing recipes! I’ll send a message as well. Beautiful dish – and you had me laughing out loud about your mom and the bread! Too cute! And my mom was like your dad with all of the salads. Making this immediately!! And will contact Pinterest ?? Goat cheese under the skin?! You just blew my mind. I have also contacted Pinterest! I pin almost all of your recipes, it would be a real bummer if they don’t get this fixed. Just contact Pinterest. Hopefully this gets resolved quickly because I pin almost daily from your site. I mean, just contacted Pinterest! THANK YOU! It is all fixed now! ps: just contacted Pinterest, hopefully this issue gets resolved soon! Yummy! Anything with goat cheese just has to be amazing! Can’t wait to try once the weather cools off a little. I was so upset when I was trying to pin recipes yesterday! I googled a bit and it may be because so many people pin your stuff, it creates a lot of traffic. But that’s the whole point of Pinterest! I love your recipes and make them all the time, my husband even follows you on Instagram and tags me in the comments when he wants to try certain things 🙂 I contacted Pinterest again for you! Hopefully it gets straightened out! Fixed. Tried to forward you their response to me, but can’t find an email address. PINNED! Honestly, thank you so much for your efforts, I am SO grateful! Hope you had a great day! Complained to Pinterest, and after some back and forth, they said they’ve removed your site from the “blacklist” – and indeed, I was able to pin once more from here! Can’t wait to give this one a try! OMG! Thank you so much for your efforts, I am SO grateful! Hope you had a great day! Sounds and looks amazing. Would love to try but only have cows milk feta. Would this work instead of goats cheese? Hi! I think that should work fine. Hope you love this!! Tieghan!! This looks SO GOOD. How do you think a crock pot conversion of this recipe would turn out? Was thinking of using cornish hens. Hmm, I honestly do not know. I have never cooked a whole chicken in a crockpot, nor have I cooked cornish hens. SOoo, I really cannot say. Let me know if you do try it though and how it turns out! Thanks! What an awesome dinner to start off fall with!! Looks delish! Happy fall! 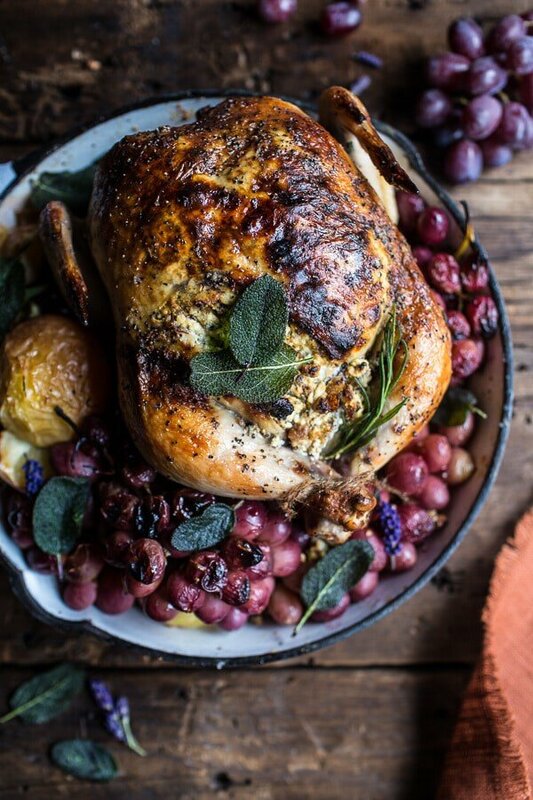 🙂 This is beyond gorgeous, roast chicken has never looked better! Very likely making this this weekend. It looks and sounds AMAZING! MY question is…. for the garlic…. you simply said- 1 head of garlic, bottom sliced off to reveal the cloves… and of course sounding so simple my brain assumes I’m missing something. Do I leave all that peel’y skin on? Just chop off the bottom and stick it in the bird? Or do I need to peel all that stuff off the garlic first? Yes, leave the skin on and stick it in the bird! The garlic is just adding flavor, you will not eat, so you can leave the skin on! Hope you LOVE this. THANKS!! 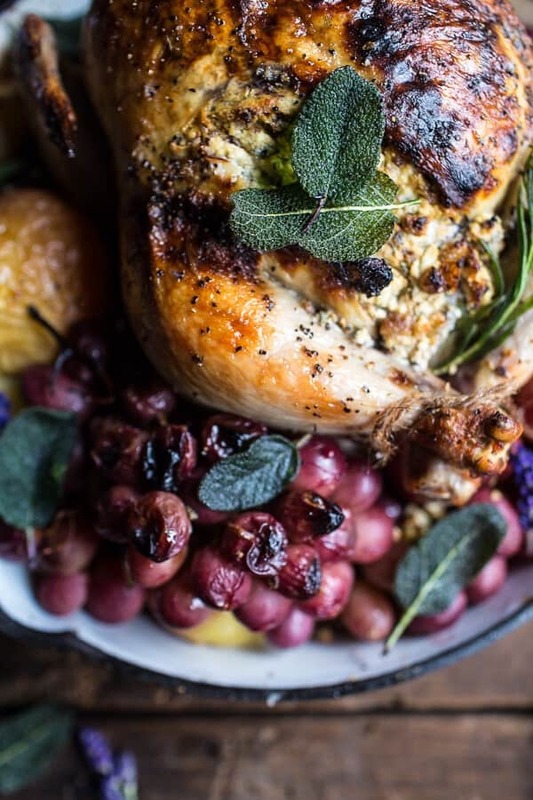 Cider roasted chicken sounds like an incredible feast entree–and with walnut goat cheese and grapes?! I mean, might as well set up a candlelight picnic dinner! SO happy you love this! Makes me so happy! THANK YOU! So, I made this dish last night and it turned out perfectly! It even elicited a curse word from a typically non-cursing guest while taking the first bite. Major hit! I had just been apple picking on Saturday so I threw several sliced and peeled apples into the bottom of the roasting pan (in addition to stuffing the chicken) with the grapes and cloves of garlic. Next time I will add more of the cheese/walnut mixture to the bottom as well because the flavor of the apples, grapes, garlic and cheese mixture was phenomenal! Thanks for a great keeper of a recipe! I just came across your blog a couple of weeks ago and this was the first recipe I have attempted. I made this last Sunday and- BEST. CHICKEN. EVER. We absolutely LOVED it and I’m sure I will be making it again. Thanks for putting together such an awesome combination of flavors! Will my grapes burn? I feel like an hour or more is a lot. Yours didn’t burn though right? HI! Mine did not burn. A few on the top got a little charred, but mostly I think the chicken protects the grapes from burning. If you want, you can cover the grapes with foil towards the end of cooking if they look like they are getting brunt. Hope that helps and I hope you love this dinner! I am planning to make this recipe this week and have a quick question! 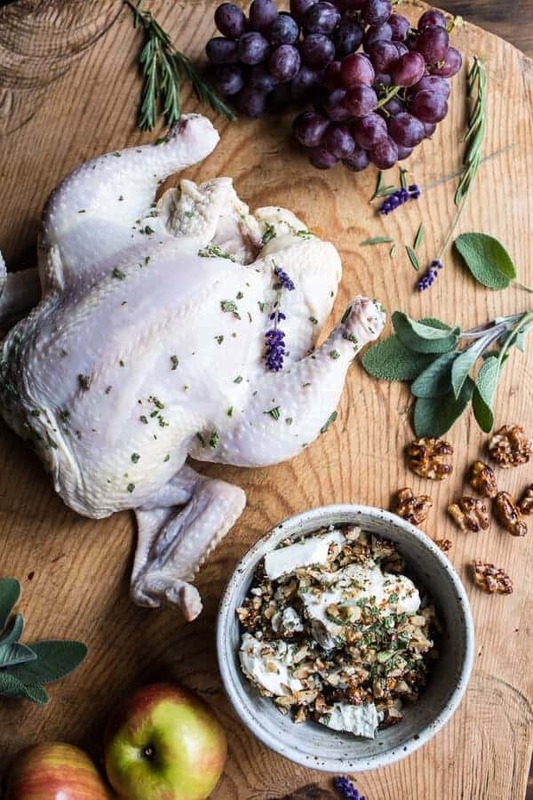 When you say to put the four pats of butter “around the chicken” do your mean to put them ON the chicken in various places or around the chicken as in on top of the grapes? Thanks! Hi Liz, yes, I mean on the chicken. Sorry, this is kind of confusing! Hope you love the chicken and let me know if you have any other questions! this looks so delicious!!! just curious as to if this could be done with a small turkey instead of a chicken? Hi Taryn! I honestly am not sure, BUT I would think so. I have actually not cooked a ton of turkey, so I am not as comfortable instructing you on that. But again, if I had to guess, I think it would be great!! Let me know how it goes! Hi Karen, I am sorry this recipe did not go over well for you. I have had many readers make it with success, so I am not sure what happened. If you feel the chicken/cheese was a little burnt, I recommend covering the dish with foil until the chicken is cooked through. That should fix your issue. Also, what type of goat cheese did you use? 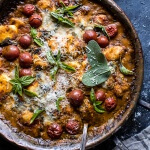 Hi- looks amazing and I’m planning on making it this weekend. Question: What kind of apple cider did you use? Sorry for not grasping, but is it the cider with alcohol, or without? HI! I just use cider without alcohol, but hard cider will work too. Hope you love this! THANKS! I made this the other night and it was amazing!! 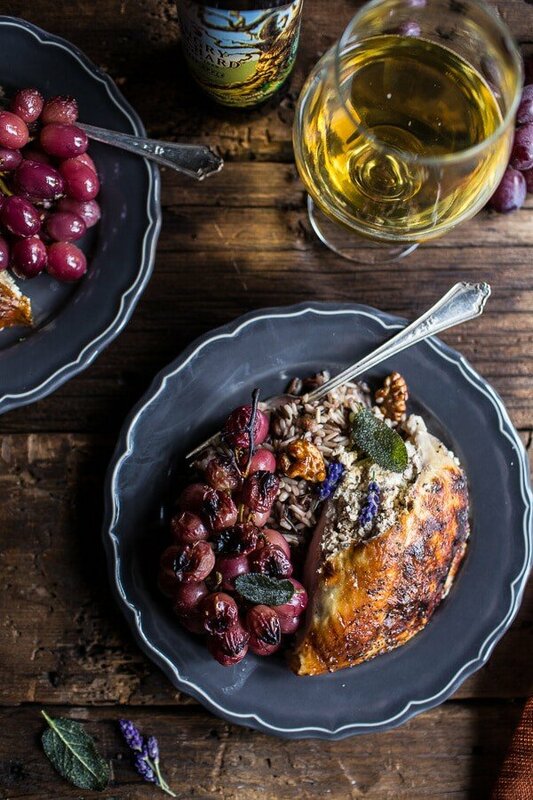 The chicken was incredibly moist and tender, and the grapes were a sweet and juicy touch! Love it. Made this yesterday for a Sunday roast and OMG it was amazing! Everyone absolutely loved it! Even without brining they said it was the juiciest chicken they’ve ever had and the even the picky eaters LOVED the grapes! Another GREAT recipe! Thank you! YA!! So happy it was a huge success! THANK YOU! Amazing recipe!!! I am a college student, but I love cooking and I made it yesterday. It’s juicy and delicious. I couldn’t find Apple cider in the store, so I just used organic apple juice and While zinfadel wine. Your recipe rocks! I have a question though. The top of the chicken turned black. I baked it with 426F. Any idea why? Hey Polina! Did you have the chicken up towards the top of the oven? You can also cover the chicken towards the end of cooking to keep it from burning on top. Hey! I was just wondering when you put the goat cheese mixture in between the meat and skin, do you put it all the way back or do you spread it out between the meat and skin? I love this recipe and the pictures look beautiful! Hey Brooke! You spread it under the skin, between the meat + skin. Don’t pull the skin all the way back. Use your hand to kind of push it back. Does that make sense? The goat cheese should be crumbled. Please let me know if you have any other questions. Thanks so much and I hope you love this! THANK YOU! I can’t wait to make this for a HALLOWEEN dinner! AHHHH! Sorry, I forgot to ask if the goat cheese has to be crumbled or in bigger chunks? THANK YOU! I just bought my first roaster and this is going to be my first recipe to try! I’m excited and VERY nervous! I have never worked with a whole chicken before. Thank you for all the detail in the recipe! I see you served this with rice. Another side dishes that would accompany this? Is another side even necessary? Hi! I’ve made a few of your recipes before and have 2 questions about this one. 2. When you say to put 4 T size pats of butter “around the chicken” does that mean slap it right on the chicken or around it like basically ON the grapes the chicken is resting on? Q1: so peel away most of the skin, leaving just one layer and then chop off the top 1/3 of the garlic to reveal the cloves. Does that help at all? Let me know if you have further questions. Q2: I mean to put the butter on the chicken. Hi! 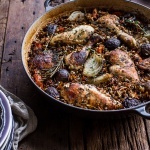 I have a 2.5 lb chicken and would love to make this recipe, but I’m guessing the cooking time will be way too long–how long would you suggest? I made this. I cannot overstate how good this is. I could’ve wept with joy. 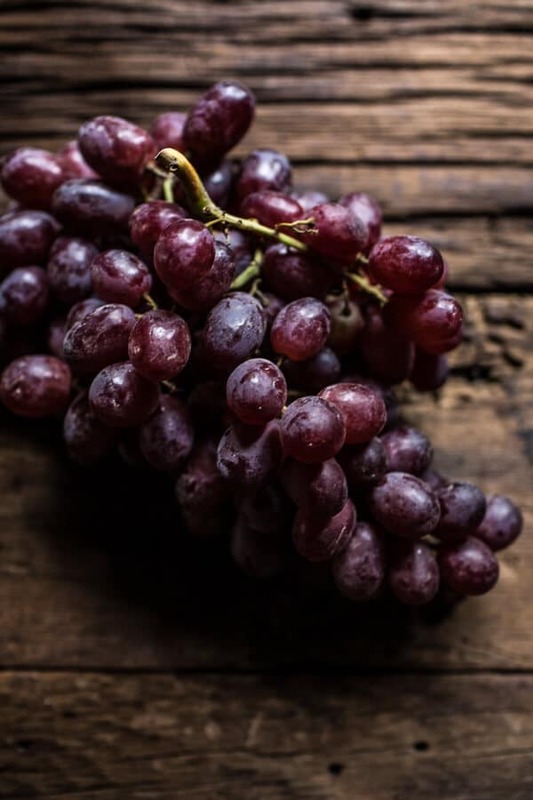 The grapes seemed weird, I did it anyway….again. I could’ve wept. This is my new favourite food group. Brava. WOW!! So so happy you liked it!! Such nice words!! Thank you Melanie! 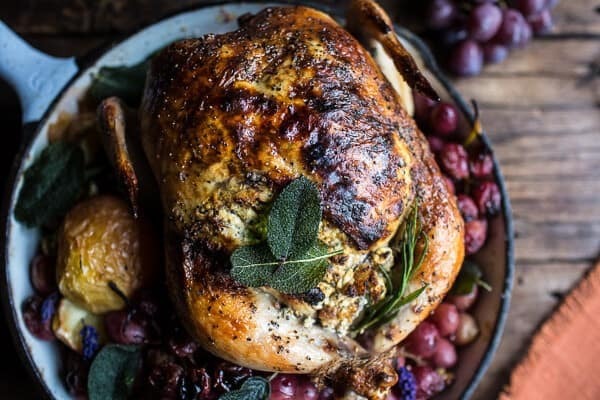 Christmas in South Africa and making this for the Christmas table… can’t wait to get it in the oven, looks so pretty already! ? Wow so cool! Hope you loved it! Thank you Mel! where did your plates come from? they’re beautiful! also this recipe is prepped and ready to go in the oven once my pie comes out! Those are from Williams-Sonoma, but I bought them a few years back and am not sure if they still carry them. Hope you loved this! Hi! My friend made this recipe and it was amazing! I have a bunch of green grapes at home and was wondering if they could work? Would it be too tart or not sweet enough, or would it not matter? Th aks! Does the apple cider give the chicken a sweet taste? My husband isn’t keen on fruit flavors in his dinner, but I do want to skin you described. Will it work with chicken broth? Or maybe a mixture of the two?? Gonna make this with your buttery pull apart whole wheat potato rolls! I’ve looked at all your autumn recipes and I’m cooking my way through them! 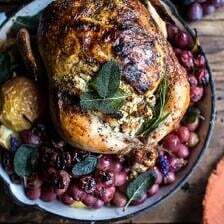 My friend absolutely loved this chicken, and went wild over the grapes and apples! My sister, who usually doesn’t even try my food, was all over that goat cheese mix. I think I messed up the temperature, mainly because my oven is fickle, so the chicken had to go back into the oven after I carved it because it was salmonella-raw-pink on the inside!! But overall, this was a resounding success at my place and I’m gonna make this again soon, to get it right this time!! I am really glad you enjoyed this Maria! Thank you! I made this recipe for my book club, and everyone adored it! One of them said this was literally the best chicken they’ve ever had! I’m already excited for the leftovers. Wow that is so amazing! Thank you so much Karissa! Just saw this and it’s already printing. I love roasted chicken and I also love goat cheese to the utmost. Those two (with the rest of it of course) are sooo a perfect match. Thank you so much for this recipe! I am so glad you loved this Maria! Thank you! Can I make this ahead of time (tonight) and keep it in the fridge for tomorrow’s dinner? Do you think it would be OK to prep the chicken the night before (i.e. season and stuff the goat cheese mixture) and leave it loosely wrapped in the refrigerator overnight?